If you found yourself in this funny situation you're not alone, the truth is that at this time there are no serious retail stores for the electronics hobbyist, however there's a booming market ! Due to the current economic environment I doubt that someone would venture to open a nation-wide retail chain like the one Radioshack has, this being the reason I decided to write an open letter to the company. 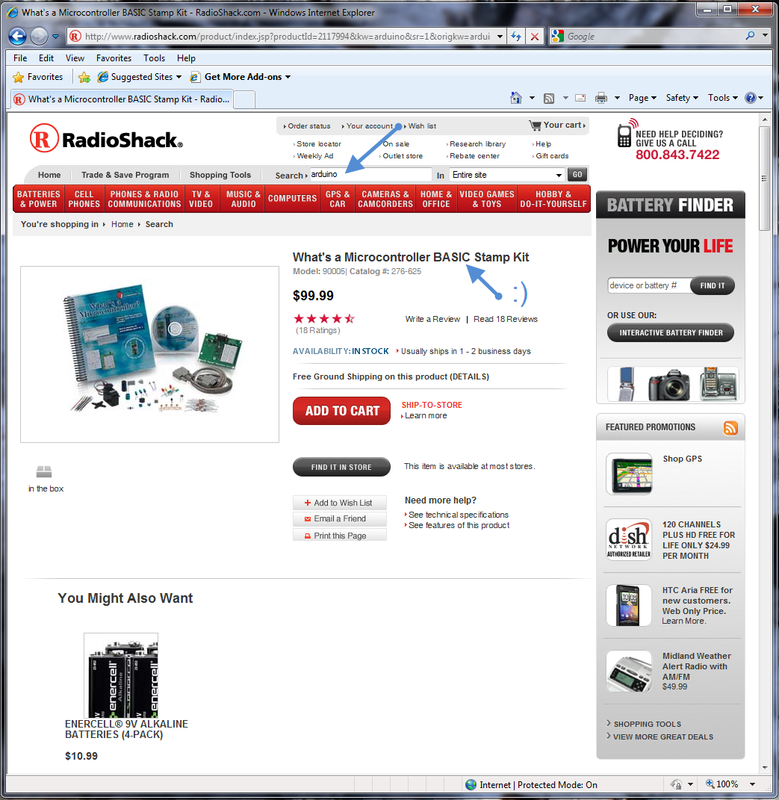 You might not like the Radioshack company but the truth is that we need them and they need us ! I am NOT going to send them this letter, instead I will put it out in the wild-wild web and let the natural selection do its work. If it makes (or when it makes) to someone in the Radioshack management – it means there are enough people who think like I think to make it happen. That being said , here is the letter, if you'd like to join the petition, leave a comment, post it on your blog, do whatever you feel like, just keep it civilized please. We the electronics hobbyists of America would like to inform you that we are back ! Our soldering irons got cold during the 90's and 2000's which made you pull all that interesting stuff to the back shelves. But we are the new generation and we are here to continue what our fathers and mothers have started, we are here to invent , change modify and rebuild this country back to it's glory days. We need your help though, we want our voices to be heard, we feel like you're not in touch with reality, while you were sleeping companies like Adafruit, Sparkfun, Make Magazine and many many others , have created a huge online community of new engineers and inventors who are the only hope that this country will once again regain it's edge in the technological field ! You shouldn't be threatened by these online retailers, neither should they be threatened by you, you should instead try to work together with them. In fact as a start you should try to resell their kits, they don't mind anyone copying their work, in fact they publish the schematics, code and advices how to use their products. They are not threatened by anyone, because they will never run out of ideas, they will always be one step ahead, and as long as this happens in our country we all have to gain ! We admire that you started carrying Parallax products, however we find it somehow funny that searching for "Arduino" on Radioshack site returns "The BASIC Stamp Kit" , why not just start carrying Arduino just like Jameco recently did ? If you're concerned that you don't have the market yet to pull those products from back shelves and create a larger inventory, don't forget that a market is not only the market that you have, but the market that you're going to create. Next time a father or mother enters your store to buy batteries she might see all those interesting electronics kits and decide that's a good thing for their children to do in order to keep them busy and away from trouble. Why not get more involved in the community and organize or sponsor some electronics clubs, because we know you were sleeping – they are called nowdays "hackerspaces". But don't worry they have nothing to do with hackers and bad guys, in fact they are very friendly and open to anyone. We understand that things might be tough in the financial chapter right now, it might seem strange but we want to give you our money , just give us the stuff we need! We are here to help and give you feedback. Together we can change many things for the better. Never underestimate the power that our online community has! Up here in Canada the Radio Shacks used to be a good resource back before the internet days. We also had a ton of good electronics parts stores where you could buy just about anything you desired in single quantities. The Radio Shack stores have all been converted to The Source stores now and are basically small Best Buy stores. We now only have one or two real electronic parts stores that have survived but I think they must be making their money selling test equipment to high end customers since their over priced single quantity parts would turn away most hobbyists. It will be interesting to see what happens in the following years as this bubble of electronic tinkering interest continues to grow! Yes, The Source has really gone to hell for parts. The only thing somewhat reasonably priced there are some of the multipole switches, $5 for two resistors, keep ’em. Future Shop used to have some stuff too in the big stores, and failing that you could pick up a catalog and order. I have to head into Toronto for project parts these days. For other hobbies, the same idiot move has happened. Complete cutting off of the grass roots. I’m thinking in particular of model aircraft/boat/car stores that used to flourish, then they decided to stop carrying sheet stock, stop carrying small beginner kits, stop carrying DIY bits and pieces and concentrate on the big ticket kits and rigs, and “ready to fly/float/roll” packages… in short they became second rate toy stores, with real expensive toys, hoping to entice the “beginner” in the hobby with $800 ready to go packages…. yup, they lost a whole generation of 10 year olds with their pocket money and died a couple of years later. Those abandoned 10 year olds are about mid-late 20s now, and finally discovering “hobbies” in the traditional sense. In Atlanta we Have a FRY’s store that has a good selection of components, however the store clerks are just that. If you need tech help you are out of luck. They are a nation wide chain and sell coffe makers to doides. I think that the same that happened to Rasioshack has actually happened all over the world, in Torino, Italy it’s just the same. My uncle is an old time electronic hacker so when I started hacking with Arduino a soldering iron and more tiny cool components I asked him where could I buy some components (resistors, led, etc..).. He suggested 3 places but unfortunately most of them have been converted to TV/Media/Computer shops and their knowledge/availability of electronic components is ridiculous. Fortunately I was able to find a tiny shop here, called Siro Elettronica (http://www.siroelettronica.it/) which sells components and has Arduinos and more cool stuff. For the most uncommon parts, eg for SMD components, I still have to order online. Anyway, yeah.. the hobbyists are back and it’s only a matter of time until will rule the world again! We have heard your voices. We are not going to deny that we have let the hobbyist business run on auto-pilot for several years now. The times changed, so we changed with it. Now the times are changing again. Hobbyists have remained dedicated to RadioShack for the better part of a century and we recognize that you deserve the same dedication from us. Our goal is to substantiate our loyalty to you. We know we must have a greater selection of products that you want and as much of it as you need. We promise we are working on it and that it is as important to us as it is to you. In the last two years, we have added over 150 new items to our technical assortment. We are working on a plan to get more hobby kits and test equipment into stores but we don’t expect that to be the end of the conversation. We do not underestimate the power of the online community, and we would love to hear more from you. We think this is a great beginning to a dialogue and we are listening. I went into my local RS recently to get a 10w 10 ohm power resistor, and I needed it now. The three clerks eating tacos didn’t know where the resistors were, but we found the drawers. Most were 1/4 watt. They gave up. I continued and found the one cell in teh back of drawer 2 that had my part. Maybe I should get a job at RS. Oh yeah, I am too old. It’s great that you’re back on business.I hope improvements would come along. I am 46 and remember the days when radio shack had all the great parts, tons of them in those nice drawer style cabinets. Over the years they have almost vanished to the point that each store has only 2 cabnet drawers left, at least in the stores I go to. I did see they have a wide veriety of Arduino kits, a few decent begginers kits and some tools. Maybe they are turing around a little, maybe because of this letter? Who knows, I do know that $1.49 for 5 1/4 W 1K resistors was a little high considering ebay has them for less than a penny each, maybe made in China but what isnt. They work just as well as an expensive one for hobby use anyway. I saw 2500 1/4 watt resistors in any value for $18 with free shipping from China. No wonder our country is loosing so much business to the overseas markets. If RS would build their inventory of parts back to what they had in the 80's I would shop there just to keep my money in the US as long as they brought the prices down to a real world level. Come back Radio Shack we miss you!